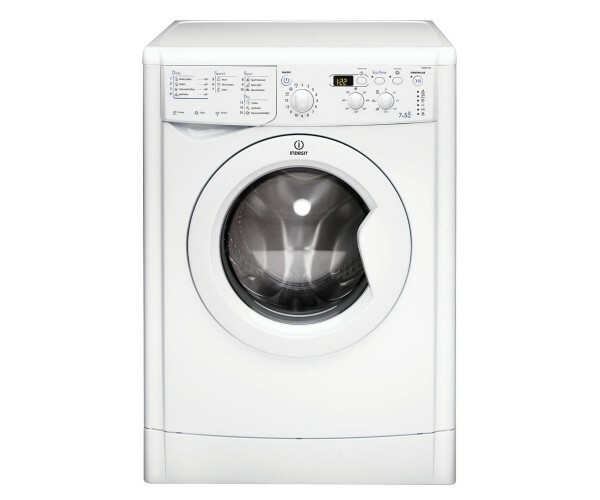 Product information "Indesit IWDD7123 7kg Washer Dryer"
The Indesit IWDD7123 is a great-value dual-function washer dryer: the ideal space saver, this machine will dry almost a full wash load, with a 7kg washing / 5kg drying capacity. It has a load balancing system, automatic water level control and a detergent recycling system so you don't need to use so much The Indesit IWDD7123's numerous wash programmes include a special function for sports clothing and shoes, wool, silk/curtains, jeans and lets not forget Indesit's Eco Time - use this button whenever you need to wash a smaller load and quickly for strong savings in water and energy. Operation is straightforward thanks to the interactive LCD display with time remaining and spin speed notification, and you can delay the start of the IWDD7123 by up to 24 hours to coincide with off-peak electricity timing. The condenser dryer section of the appliance has 3 level sensor drying and a dedicated Express Wash & Dry cycle for smaller wash loads, for the ultimate in convenience. Related links to "Indesit IWDD7123 7kg Washer Dryer"
Customer review for "Indesit IWDD7123 7kg Washer Dryer"